I told my father Iwould tell his vase story on my blog. He told me more stories. If a Living National Treasure dies, his products will increase in value. Then, the values never drop down and keep increasing. It is not a good joke. It might be a good investment, if I find good young potters. It is one of the joys to collect pottery. There are 26 Living National Treasures in pottery. Hello, I've found this blog by Google, it's very very interesting !!! Omedeto. 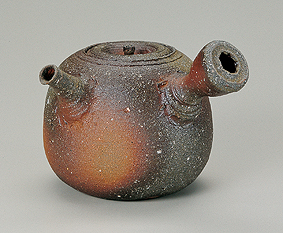 I have been looking for a Jozan Yamada teapot for years. I ran across this website and was so pleased to find so many of his teapots. Are any of them for sale? Thank you.